I’ve been seeing a lot of dipped kitchen utensils lately so thought I would try making my own! They were very easy to do and would make a lovely gift for a housewarming or kitchen tea. I bought my utensils from Wheel & Barrow. 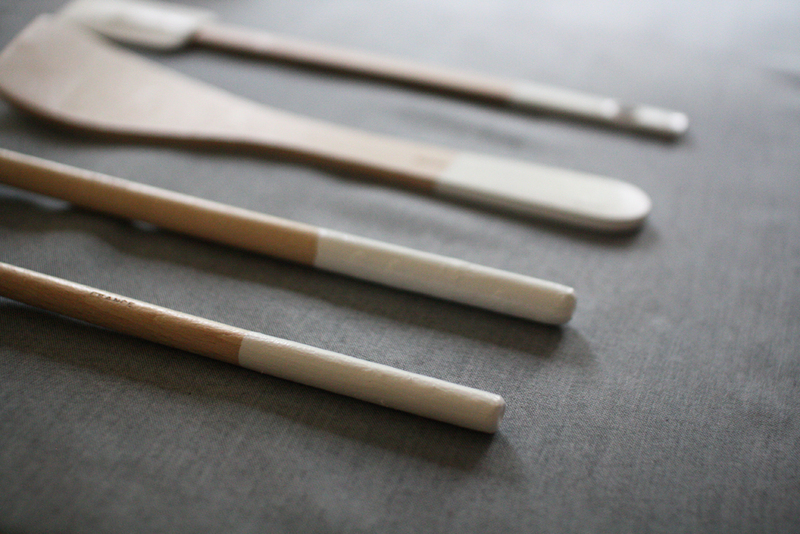 Any wooden utensils will do fine, but I loved the classic shapes and light beech wood of these French ones. It would also be fun to try with vintage pieces collected from op shops and markets. 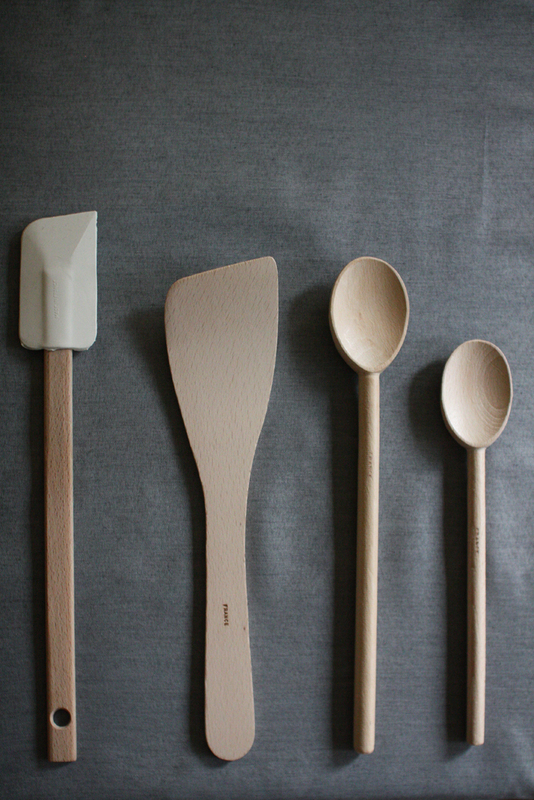 I thought white paint would look lovely with the pale wood of these utensils, but you could try it with any colour you like, or even with a rainbow of colours (like this!). 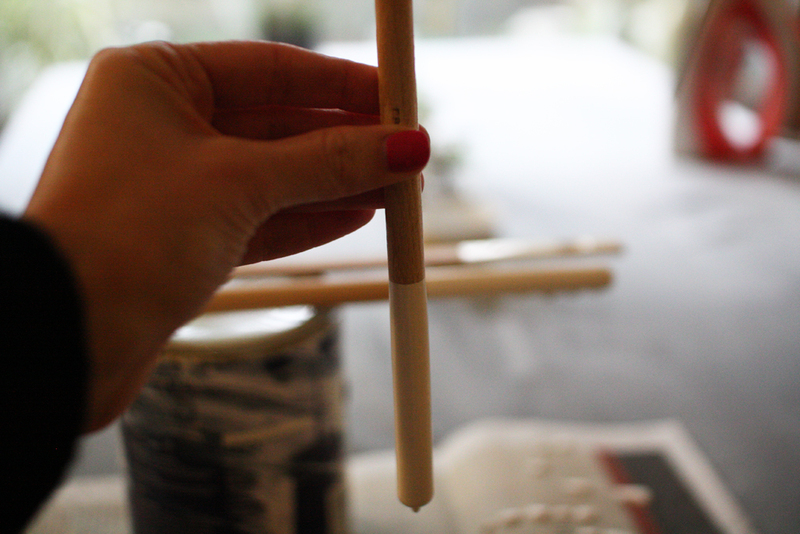 Work out how much of your utensils you want to dip in the paint – I dipped about 8cm on each utensil. You want to make sure the paint doesn’t come anywhere near the areas of the utensil that will come into contact with food. 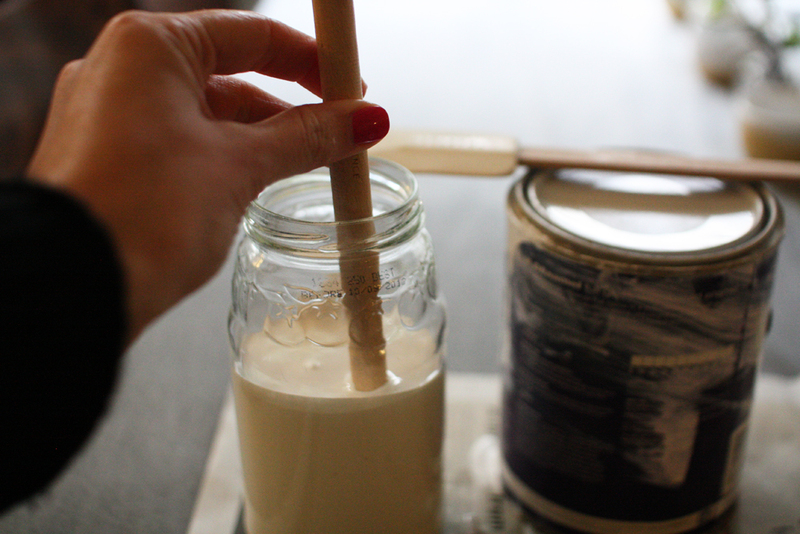 Pour some of the paint into the glass jar so that it comes up just as far as you want the paint to come on the utensils (e.g. in this case 8cm). This is an easy way to make sure you dip each utensil to the same depth. Dip your first utensil in the jar. Pull it straight out and hold it over the jar for a few moments to let the excess drip off. 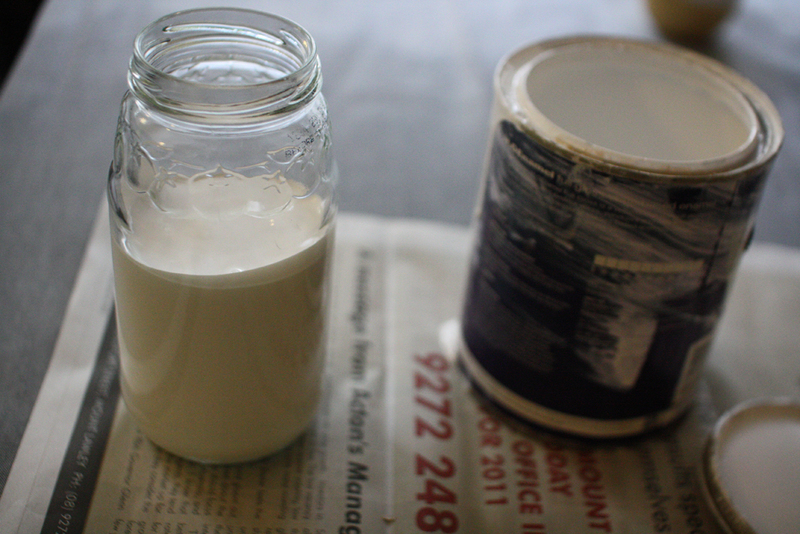 Once the dripping has slowed, lay it down on top of your paint tin so that the dipped end can drip onto the newspaper. Repeat with remaining utensils, making sure you don’t let any of them touch as they dry. Keep an eye on them as they dry – over the first hour you will need to keep rotating them every ten minutes or so as they dry to make sure all the drips even out. Once they have finished doing all their dripping you can leave them to dry overnight. The next morning you will have yourself (or some lucky person!) 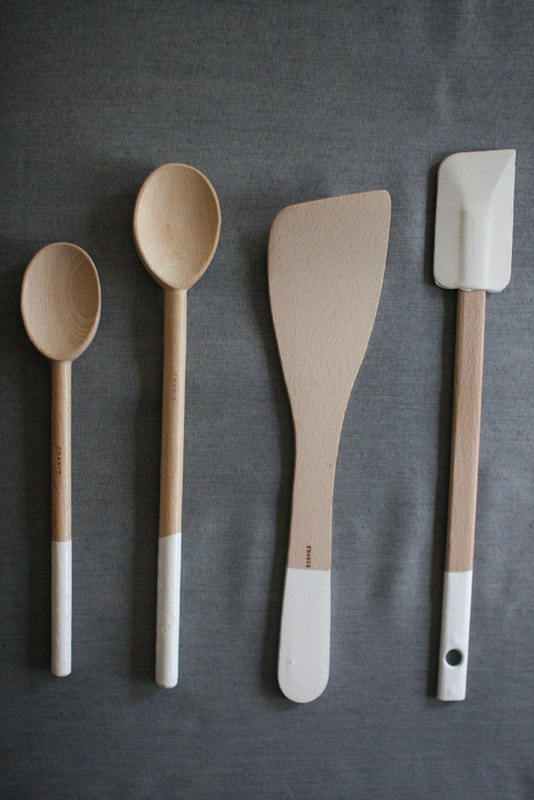 a lovely set of dipped kitchen utensils! These should survive regular handwashing, but I would avoid putting them in the dishwasher. 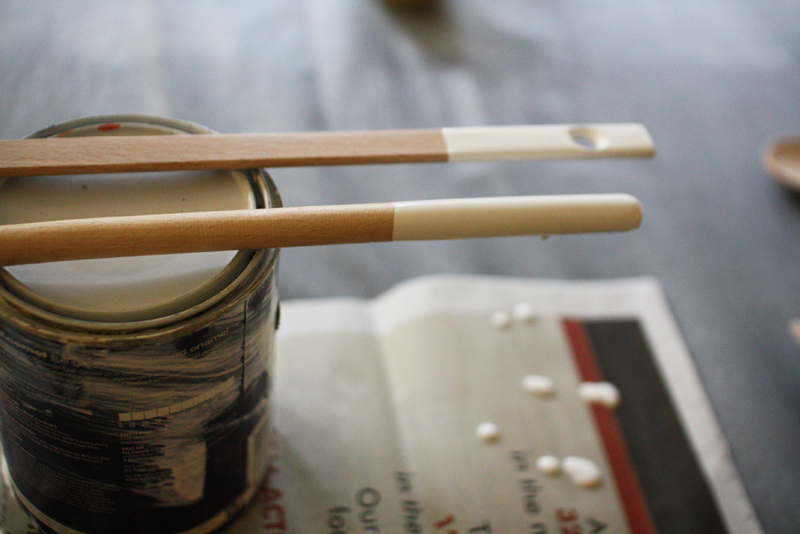 If over the years the paint starts to wear away, you can always just dip them again! 28 Jun	This entry was published on June 28, 2012 at 9:43 am. It’s filed under make and tagged make. Bookmark the permalink. Follow any comments here with the RSS feed for this post.